Apple on Thursday confirmed the takeover of LearnSprout, a startup company specializing in educational analytics, particularly for tracking student performance. "Apple buys smaller technology companies from time to time, and we generally do not discuss our purpose or plans," Apple spokesman Colin Johnson commented to Bloomberg. The phrase is Apple's standard boilerplate for acquisitions. LearnSprout software is used by over 2,500 school districts across the U.S. Apart from grades, its software can be used to track patterns in categories like health and attendance. Despite Apple's refusal to discuss details, the acquisition is almost certainly related to the company's efforts to get more iPads into classrooms. 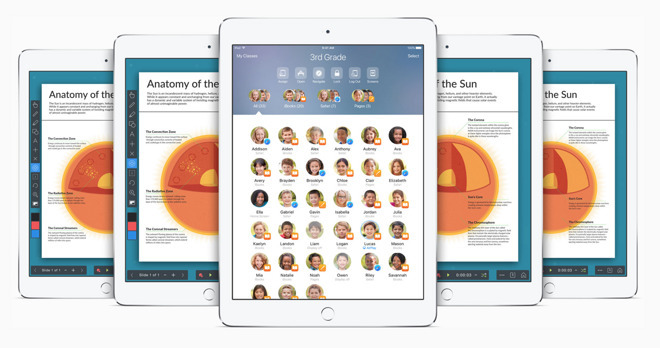 iOS 9.3, for instance, will allow a single iPad to be used by multiple students, and introduce a Classroom app for teachers. More importantly the company is introducing a Web tool called Apple School Manager, which will let administrators handle large-scale tasks like creating Apple IDs, building courses, and making volume app and book purchases. LearnSprout's technology could potentially be integrated into School Manager, making it an even more comprehensive system.